A Tray of Bliss: Finding 50 and Fabulous...the Supplement debate. 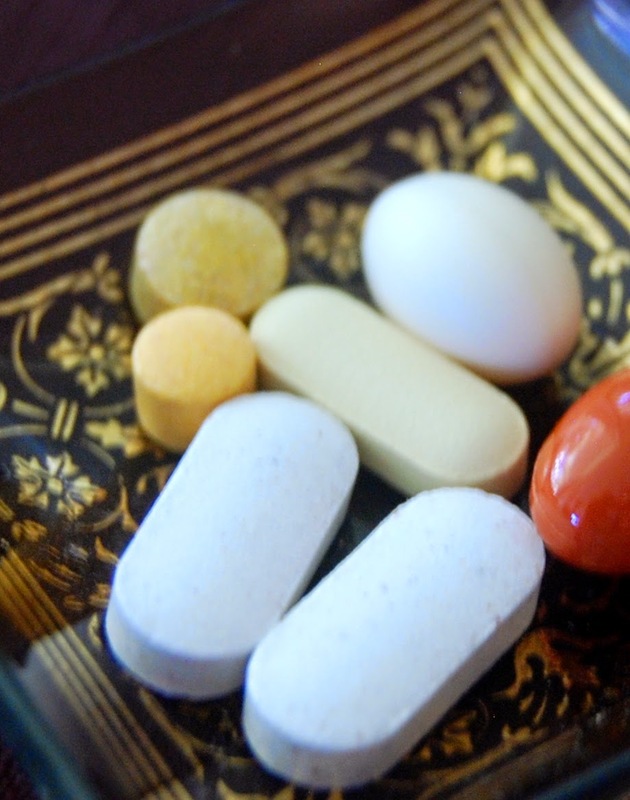 What do you think about taking supplements to ward off ills, and hang on to youth? I'm consistently divided. Is that a tautology? Like luxury skin care products vs budget ones, there is much debate surrounding the popping of multivitamins and supplements vs following a normal healthy diet to prolong our looks and good health. I've taken supplements on and off for my entire life. Much as the use of both luxury and budget skin care has been a lifelong practice, I've felt compelled to do so by a Mother who was queen of 'do all you can to stay healthy and live long' proclamations. All I can categorically state is that I believe that had I not done these things, I may look or feel differently to the way I do at the age of 54. I will never know how much impact this practice has had, as it might equally be that I haven't smoked, taken recreational drugs, or consumed other nasty substances. Well....that is to say that I do enjoy a glass of wine, I do eat butter, I do eat sugar. I'm human. And I do not subscribe to current thinking that one or the other of those things is evil. Call me a rebel. I do not eat processed foods if I can help it, and takeaway in all forms is banned in my house. That's just a snobs choice if you will. I cook a better burger than either the M people or the HJ people, and my grilled salmon leaves the one from the takeaway down the road for dead. Although I admire greatly, the addition of 'grilled salmon' to the menu of the local fish and chippery. Perhaps that has helped. I've done a lot of reading and layman's research, and I think overall I prefer to take a few supplements, use organic skin care, and eat sensibly, than risk my health and vastly diminished youth ju-ju (my terminology for whatever happy hormones may be left floating in my body post menopause), than not. Many of these also support organs in the body other than the skin, so that in itself is beneficial. I force the first six down with a swig of the seventh in a glass of juice each morning and feel very pious. I recently bumped in to a girl I used to go clubbing with, back in the hey day of the Disco in the 70's and 80's. I wouldn't have recognised her by her appearance. It was her curly hair, her eyes, and some certain mannerisms that jogged my memory. Well...that and her name on her name tag. When I mentioned to The Diva Daughter that the lady had been a friend many years ago, she was incredulous. The poor lady looked fifteen years older than me, and she is in fact two years younger. A victim of the drinking, drugs and debauchery of our era. Sad really. Even sadder was the resignation to her lot in life, her sparkle gone and all traces of the pretty twenty year old I once knew, lost forever. So perhaps much had occurred in the intervening years. Still, part of me wonders how much our respective lifestyle choices, including the taking of nutritional supplements over recreational ones, figured in the difference in our appearances thirty years later. All I can say for certain, is that if you're twenty or thirty-something, and reading this, is....beware....it catches up with you....lol! Mimi, you certainly look beautiful and dewy to me, so your regime does work!!! I only take a fair whack of vit C all through winter, and vit B when I feel stressed - maybe for a month of two. Supplements yes! I take a similar concoction to you and I figure that if we are wrong on this ( which I severely doubt ), what harm is there? Hi Mimi, I take vitamins too and I do try to eat healthy and I like my cooking too better than take out. I do like to eat out at a nice restaurant every once in a while though. Yes, drinking and drugs will age you a lot! I think smoking and sun baking are the two biggest things, in the past at least. More modern now I would add the next are jogging, diet soda, drugs and not enough sleep. There seems to be an epidemic of not enough sleep. I take magnesium, multi b, calcium and St Johns Wort. And vit c at times, olive leaf extract if sick ... and vit D a bottle year or so.... this lot have been a trial and error thing... the magnesium being no 1 I could not live without. Oh I am also a believer in taking asprin...I think theres nothing like a class reunion or something like that to see how everyone is going! One day we will have more information so we have to find our way with what information we have. It is always so much conflicting stuff thats the problem. I largely trust nature (ie butter, olive oil, sugar) over science (ie margarine, equal, trans fats...) thats one thing I go by! Hi Mimi, I feel the same as you, with my trials of skincare and vits and supplements. Too much contrary advice out there , so I go by my own gut feelings. I vary what I take and try and have a rest every now and then so I don't clog my system up, so to speak ;-) I take Flaxseed oil the most, Magnesium with added C, B6 & A. Also take a nail, hair and skin mix when needed, and sometimes a sustained release Multi vit and minerals.